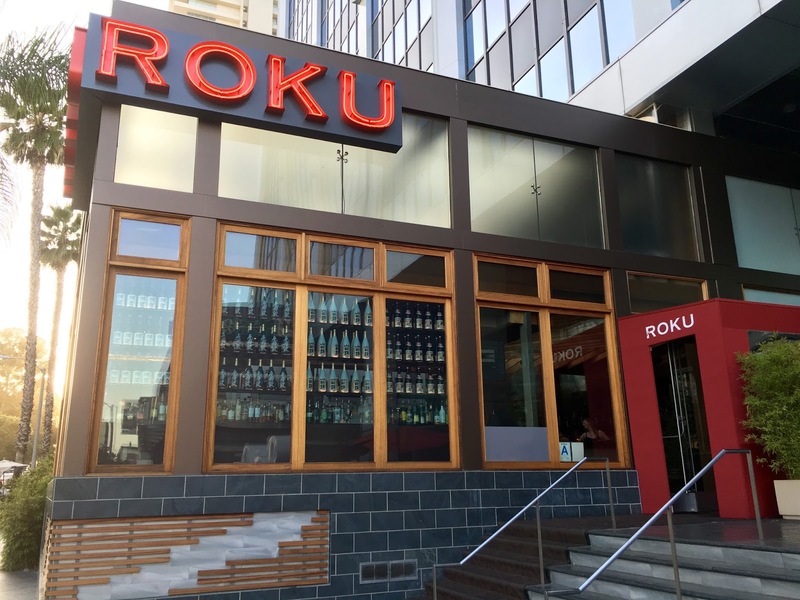 THE UNEMPLOYED EATER: The Latest/Greatest To Order at Roku Sunset. The Latest/Greatest To Order at Roku Sunset. LA is in the midst of an architectural dining renaissance. Restaurant spaces so ornate, you would swear you were in Midtown Manhattan (see Otium, Redbird, et al.). Somehow lost in the conversation is Roku Sunset though. Perhaps due its "chain" nature, it just doesn't come up when Los Angelenos bat around the city's finest restaurant spaces. As evidenced in the picture below, that's silly. If not the city's most epic, Roku Sunset at the very least can take your breath away. Especially if you eat during Golden Hour, which I accidentally did. The place has an open, RETRACTABLE ROOF that doesn't simply litter the space with a beautiful SoCal breeze, no matter the time of day, but also delectable, appetizing light. Truly a special indoor/outdoor LA dining arena. Two of the world's finest: matcha tea and the Moscow Mule, here, united, finally, as one. It's like that time Eminem and Jay-Z put out an album together - but actually good. The drink -- featuring an intoxicating blend of green tea-infused vodka, pure ginger root, fresh lemon and honey -- is both citrusy light, yet hearty, providing more of a ginger punch than most of the Mules around town. Highly recommended. Roku Sunset is not the Edison of the Grilled Avocado. But, let's be real with ourselves, kids: WHY THE EFF AREN'T WE ALWAYS GRILLING AVOCADO AND EATING IT EVERY DAMN MEAL? Seriously, it's such a solid dish. RS takes it another step up by complimenting the tender, smoky, aggressively charred, flavor-packed avo with a slightly sweet yuzu and soy sauce, along with some scallion sprinkling and a lemon squeeze atop. I want it again right now. To Share: Tuna Tartare Phyllo Cup. Ever wished all that poke you're eating right now came in a phyllo cup, topped with yuzu guacamole and BLACK TRUFFLE SHAVINGS? Me either. I've never dreamt that big. Needless to say, this dish -- which can best be described as ahi poke on top-notch European and Mexican steroids -- is stellar. It stands as a solid example of what RS aspires: unique, culturally-influenced, yet Asian-leaning. First off, I apologize for the picture, but this fella was STEAMY. Really steamy. So the fog encompassing the picture is no allusion. What lay beneath: 5 ounces of sizzling, teppan-grilled filet, mushroom, asparagus and zucchini in a smoked garlic truffle ponzu sauce. 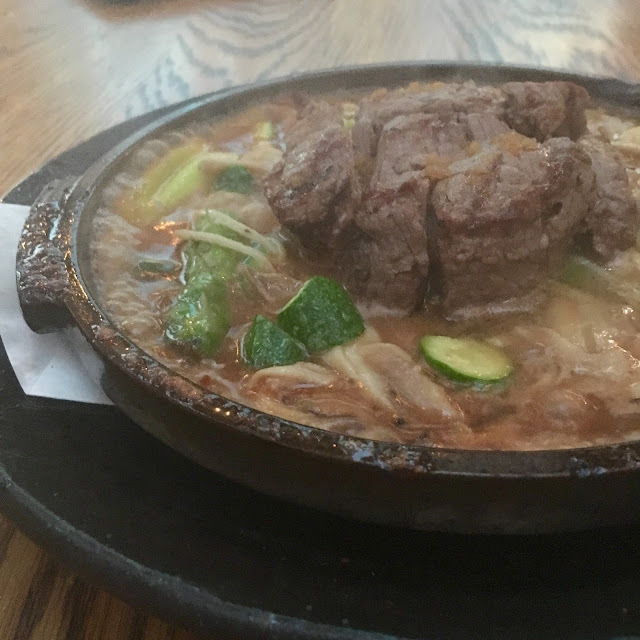 Amongst a few other grill offerings, this dish is a convenient way to experience the Teppanyaki section of the restaurant without actually experiencing the Teppanyaki section of the restaurant. 9201 Sunset Blvd, West Hollywood. We happen to meet a great people there and started to chat with them and drink w/them too. I had a great time here, glad we found this place by accident. Will definitely come to this venue Houston TX again as anyone will make this a regular spot easily.